This is a guest post by Luke M. Perez, a doctoral student at the University of Texas at Austin where he studies religion, ethics, and foreign policy. Luke is also a graduate fellow at the Clements Center for National Security at the University of Texas. He can be reached at lukemperez@gmail.com. The Empire apologists are making their case, and it is convincing. Perhaps we were wrong all along to support the Rebellion. But that doesn’t mean we should let the Empire off the hook entirely. This week for example, Sonny Bunch argues in the Washington Post that the destruction of Alderaan in Episode IV of Star Wars was completely justified. This article is interesting, thought provoking, and wrong – seeking to excuse what is, by any measure, a gross and tragic violation of just war principles. Whatever merits the Empire, whatever flaws the Rebellion, any truly reflective and honest empirical assessment of the Empire’s action at Alderaan will admit that its destruction was a tragic moral failing. The core of Bunch’s argument is the—admittedly persuasive—observation that Princess Leia is a dishonest negotiator. As he points out, she had lied about the nature of her mission when she was captured, the location of the Death Star plans, and gives no other reason to believe that she is honest about the claim that Alderaan is a peaceful, non armed planet. This via negativa argument supposedly lead us to conclude that Alderaan could be a legitimate military target. Yet there is no affirmative evidence to indicate this is the case. * We know that Princess Leia is almost certainly lying, but not what she is trying to protect. The problem with Bunch’s logic is that he jumps too soon from “Leia must be lying” to “destroying Alderaan is consistent with just war principles.” Bunch infers that Alderaan was an intellectual and financial hub of the rebellion. Ok, let’s grant the premise. But we don’t blow up banks to stop the flow of terrorist money. Surely the Empire had the means to place crippling sanctions on the flow of monies into and out of Alderaan. One only need to examine the “Alerdaan Incident” in light of a few just war principles to understand the breakdown of moral imagination in Bunch’s reasoning. Specifically, destroying Alderaan violated proportionality, right intention, and non-combatant immunity. First, the principle of proportionality stresses that only an equal amount of force be used against an aggressor. 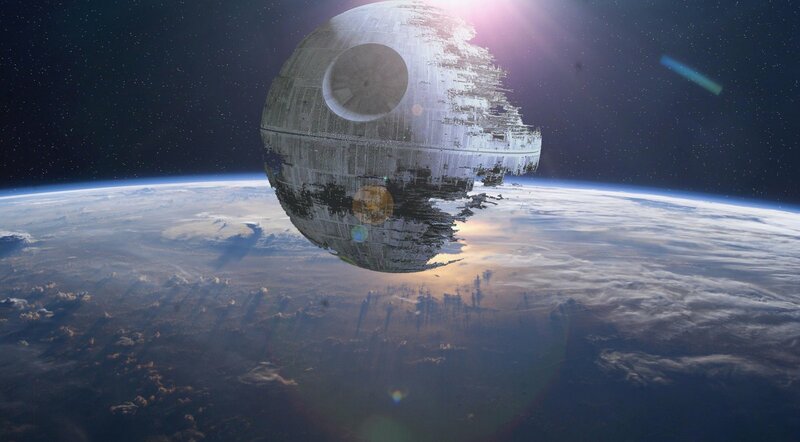 For the destruction of Alderaan to be justified under the principle of proportionality, either Alderaan must have first destroyed a semi-peaceful, Imperially aligned planet or it must have had the potential to destroy the Death Star. (For example, consider the parallel on the destruction of the second Death Star.) Neither of these conditions seem to be met. There is no evidence to suggest that Alderaan was part and parcel of attacks on the Empire. This point cannot be overstated. Financial and intellectual backing for the Rebellion is insufficient cause to warrant complete annihilation. Even if Alderaan’s government had participated in attacks against the Empire, the strength of the Imperial fleet was not in any way facing an existential threat that warranted planet-cide as a defensive measure. Second—and more importantly—just war theory asks that warring parties have a “right intention” to their aims, usually understood as a stable and just peace. Brunch and others may be right that the Emperor only wanted a stable, just galaxy. Indeed, a case could be made that the Empire had just cause within the category of jus ad bellum (but that’s a debate for another day). What is clear is that the defense of Alderaan policy seeks to situate the destruction of a planet within the utilitarian logic of deterrence. Unfortunately, utilitarianism is not part of the just war framework. Means never justify ends in just war theory. Finally, destroying Alderaan violated the non-combatant immunity principle. Just war principles demand that non-combatants are spared from the killing in war. And in cases where innocent lives are lost, all efforts must be made to minimize those numbers. Grand Moff Tarkin made no such efforts. Rather, he intentionally picked a planet who seemed to him relatively non-aligned so as to demonstrate the full destructive power of the Death Star. Destroying Alderaan wasn’t deterrence, it was terrorism. The moral failing that is evidenced by the destruction of Alderaan demonstrates the fundamental point about just war theory. Even a just war can be fought unjustly. If we grant, arguendo that the Empire had just cause for their war under the category of jus ad bellum, they nevertheless waged war unjustly and failed to meet the standard of the jus in bello. Whatever the reasons for repressing the rebellion, just war does not excuse willful disregard for waging war in a just manner. The flawed logic of Brunch’s piece cuts to the heart of a broader problem in moral theorizing. Once partisans have chosen a side, fictional or otherwise, the tendency for people is to excuse the moral failings of the partisans whom one supports. Rather than excuse everything away from “our side,” we would be better served if we acknowledged that even the good guys are prone to moral failings. This does not detract from the worthiness of a cause any more than it justifies the opposition. Rather, it is worth reiterating that war is hard, that even just causes can fail to achieve their ends in a just manner, and that the final aim of any conflict is, and ought to be, a just peace. However hip it may be to pick the ironic regime, we are not excused from clear moral thinking. *I follow Last in looking only at the original films as evidence of Lucas’s “Original intent,” ignoring the expanded universe. We might call this Star Wars originalist jurisprudence.